Former Tallahassee Mayor and Florida Gubernatorial Candidate, Andrew Gillum, didn’t break the kind of news that many publishers, editors and journalists may have wanted at the National Newspaper Publishers Association’s (NNPA) annual Midwinter Training Conference in Orlando, but the HBCU graduate did provide the Black Press of America some newsworthy tidbits about what he’s doing now and what the future might hold. The luncheon was sponsored by General Motors and Wells Fargo and representatives of both companies were on hand to talk about their commitment to the Black Press. Gillum, who lost a tight and controversial race to Republican Ron De Santis by just 30,000 votes, said he has also been spending time with his family. However, even with a wife, three children and a new teaching job, Gillum also hasn’t lost his focus on politics or the 2020 presidential election. “My grandmother says ‘know better, do better,’” Gillum said. “I learned something about the gap that exists in my state and that there are road barriers for the Democrats. The young voters turned out at the highest rate in the history of the state of Florida,” he said, noting that his goal is to help register 1 million voters by the 2020 election. He called relationships like that a win-win where there’s major benefits for each party, but he still commended those companies for “putting their money where their mouths are.” It’s something that presidential and other political hopefuls should follow, Gillum said. 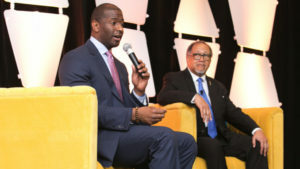 Chavis told the Democrat that the Black Press couldn’t be more proud of his efforts.” All of us, and Mayor Gillum, let me tell you that we represent over 215 African American newspapers and media companies across the country and, conservatively, we reach about 25 million in print, digital and social media,” Chavis said. “There’s about 47 million African Americans in the country and we reach the majority. On behalf of the Black Press of America, we couldn’t be prouder than to witness your campaign,” Chavis said, in a comment echoed by Houston Forward Times Associate Editor and Columnist Jeffrey Boney. Since the election, he said he’s been invited to speak at many events but has remained selective. However, he said the Black Press remains important, which is why he accepted an invite to attend the Midwinter Training Conference. Gillum also took time to thank Chavis, NNPA Chair and Crusader Newspapers Publisher Dorothy R. Leavell, and other members of the Black Press for fair and accurate reporting during his campaign. He said he’s picked up a few lessons from his campaign, including how important a role Florida played in past elections and how critical a role it’ll play in future campaigns. “In terms of electoral politics and where we are going as a nation, the conversation is on full display here,” Gillum said. Gillum referenced the recent CBS News release which touted the network’s 2020 election coverage team. It didn’t include an African American and has since drawn the ire of those in the Black community. “It’s a problem,” Gillum said of the CBS release.